Maryan (pronounced Mariyāņ; ) is a 2013 Indian Tamil drama film directed by Bharat Bala starring Dhanush alongside Parvathi. Produced by Venu Ravichandran, the film has music and background score composed by A. R. Rahman and cinematography by Marc Read More.. Description Maryan (pronounced Mariyāņ; ) is a 2013 Indian Tamil drama film directed by Bharat Bala starring Dhanush alongside Parvathi. Produced by Venu Ravichandran, the film has music and background score composed by A. R. Rahman and cinematography by Marc Koninckx. Dialogues in the film are penned by R N Joe D' Cruz. The film revolves around a story of human survival adapted from a newspaper article of a real-life crisis event, when three oil workers from Tamil Nadu were kidnapped and taken hostage in Sudan by mercenaries. The film is an emotional journey of a common man to an unknown place with the hope to come home and lead a better life. The film released in Auro 3D sound format on selective screens in India and worldwide on 19 July 2013. The film received positive critical reception in India. At the Box Office of United States, the film had the biggest opening amongst all Indian films releasing on the same date. However, in Tamil Nadu the film was declared as an average grosser. Chennai Box-Office – July 26 to 28. Sify.com (30 July 2013). Retrieved on 7 January 2014. The dubbed Telugu version of the film titled 'Mariyaan' was released on 31 July 2015. Maryan (pronounced Mariyāņ; ) is a 2013 Indian Tamil drama film directed by Bharat Bala starring Dhanush alongside Parvathi. Produced by Venu Ravichandran, the film has music and background score composed by A. R. Rahman and cinematography by Marc Koninckx. Dialogues in the film are penned by R N Joe D' Cruz. The film revolves around a story of human survival adapted from a newspaper article of a real-life crisis event, when three oil workers from Tamil Nadu were kidnapped and taken hostage in Sudan by mercenaries. The film is an emotional journey of a common man to an unknown place with the hope to come home and lead a better life. The film released in Auro 3D sound format on selective screens in India and worldwide on 19 July 2013. The film received positive critical reception in India. At the Box Office of United States, the film had the biggest opening amongst all Indian films releasing on the same date. However, in Tamil Nadu the film was declared as an average grosser. Chennai Box-Office – July 26 to 28. Sify.com (30 July 2013). Retrieved on 7 January 2014. The dubbed Telugu version of the film titled 'Mariyaan' was released on 31 July 2015. 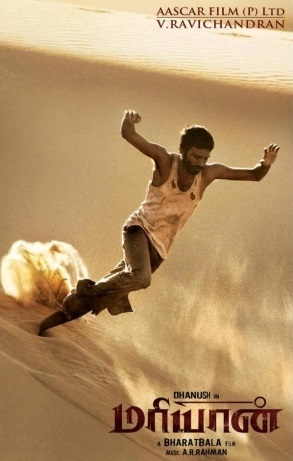 No reviews available for #Maryan-film, Do you know Maryan (film)?, Please add your review and spread the good things.